It's been foreverrrrrr since my mom has done a post on my blog so I thought it would be the perfect time to check in with her and see what she is loving right now! 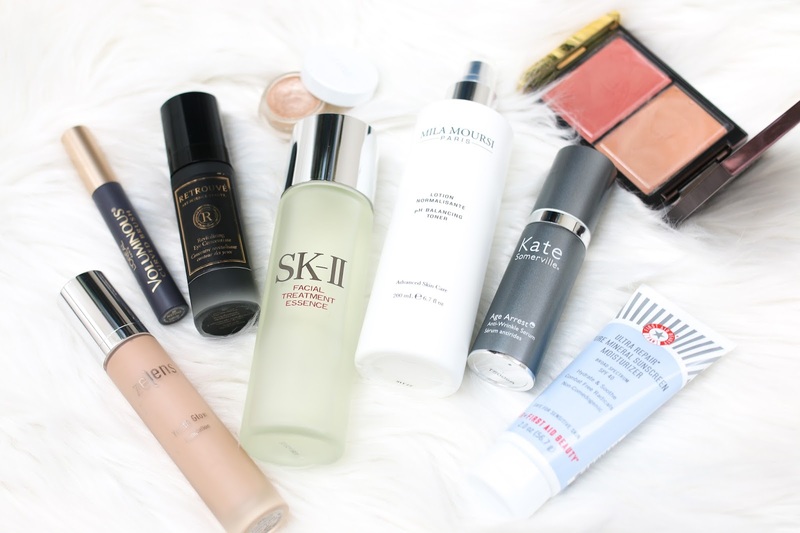 She is sharing her current morning beauty routine - both makeup and skincare. You can read her prior posts here, here and here. And without further ado, here is my mom talking through her current morning routine. 1. Tatcha Camellia Cleansing Oil - This has been a staple in my routine for years and I don't think I would ever be without it. I like to apply it with dry hands to a dry face and then rinse away with warm water. It hydrates my skin without ever leaving any feelings of residue. 2. Retrouvé Revitalizing Eye Concentrate - I've used the Retrouve Replenishing Facial Moisturizer and loved it, so I definitely wanted to try the Eye Concentrate since it was too heavy for Maree. I love the way it absorbs leaving my under eyes smooth. I never get milia with this concentrate and it definitely has minimized wrinkles. This has been a staple of mine for quite some time. 3. Mila Moursi ph Balancing Toner - I spritz this on after cleansing and it works well at helping balance my skin. 4. SK-II Facial Treatment Essence - Maree gave me a bottle of this and I had to ask her a few times how and when to use. She advised using after I tone but before I apply serum. I pour a small amount into the palms of my hands and press it into the skin. After a few weeks, I really began to notice a difference in how soft my skin felt and it appeared firmer and more even toned. 5. Kate Somerville Age Arrest Anti-Wrinkle Serum - This serum is so lightweight and only a drop is needed to cover my face. It almost feels as if my face has a smooth canvas that allows for an easy application of moisturizer and foundation. I've definitely noticed a difference in the firmness of my skin and any fine lines look much more minimized. That is why I have kept it in my morning routine because in addition to seeing results over time, I have noticed my face appears much smoother and more taut right after applying which makes it perfect for applying before makeup. 6. First Aid Beauty Ultra Repair Pure Mineral SunscreenMoisturizer SPF 40 - This sunscreen applies easily and provides a wonderful base for my foundation. At first I thought it would be too thick for wearing under makeup, but it disappears immediately into the skin and leaves it feeling so hydrated and smooth. 7. Zelens Youth Glow Foundation - I love how this foundation provides a glowing dewy coverage. Since my skin is more on the dry side, I love trying out any foundation that gives a more radiant finish. This is definitely a new favorite. 8. Beautyblender - The way the Beautyblender smoothes and blends my foundation is amazing. I definitely have a back-up at all times. 9. Tom Ford Scintillate Blush - I am a fan of cream blushes, and this Tom Ford Scintilate blush has become a staple. It applies easily with my fingers and I blend it in with a few dabs of the Beautyblender. 10. RMS Eye Polish in Lunar - Over the years I have struggled with finding an eye shadow that does not cause an allergic reaction, but once I found RMS Eye Polish I can wear it every day without ever being concerned. It's smooth to apply and wears all day. 11. L’Oreal Voluminous Mascara - I'm a long time user of this mascara and find it gives my lashes great volume with very little smudging during the day. 12. Chantecaille Lip Chic in Anais - This was a gift from Maree a few years ago, and I have been repurchasing it ever since! Many lipsticks have a tendency to dry out my lips, but this formula keeps my lips hydrated for hours. Thanks to my Mom for sharing her morning routine. Hope you enjoyed this post! All of the products she discussed are linked throughout the post or in the widget below. I am 52 and thoroughly enjoy your mom's posts. How about some wardrobe posts from her too? Thanks ! So glad you liked them! While I got her into skincare, she rarely shops for herself so she never buys new clothes. I think the last time she went shopping was 5+ years ago, so fashion isn't really her thing. LOL But we will definitely keep up with the beauty posts from time to time! Thanks for reading!